April 2016 – Canyonlands National Park in Utah is so big and sprawling that it has two entrances at opposite ends of the park. The south entrance is a 50 mile drive to the south and west of Moab, and it takes you to the Needles District. 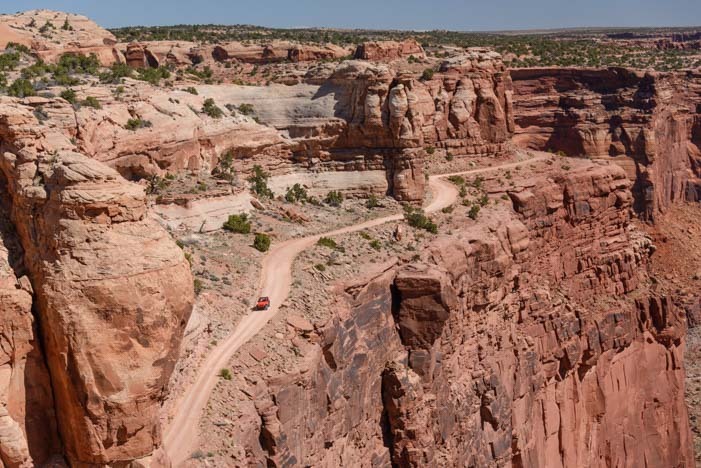 The north entrance is a 30 mile drive to the north and west from Moab and takes you to the Island in the Sky district. 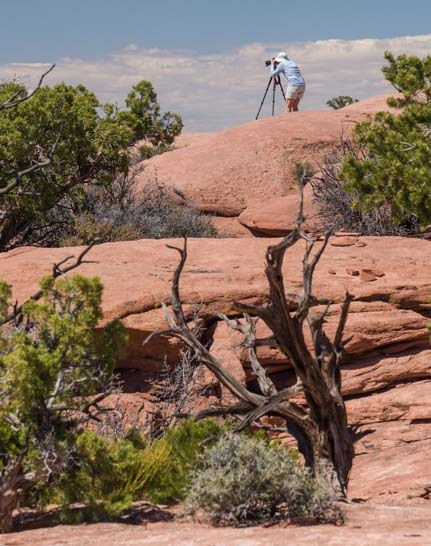 We had explored the beautiful pink and white spires of the Needles District in Canyonlands National Park a few weeks earlier on the Chesler Park hike, and we were eager to check out the vistas and views of the Island in the Sky district. 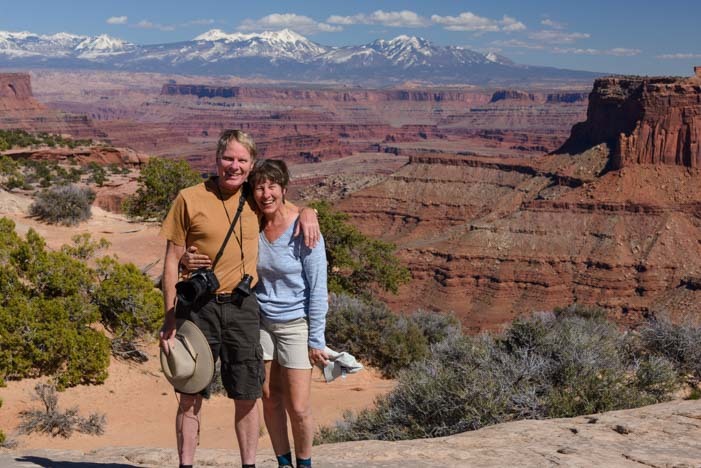 Although all of America’s National Parks are best enjoyed in depth over a several day period, with hikes out into the scenery to see the various sights up close, on this RV roadtrip we were doing a survey and an overview of all the beauty surrounding Moab. 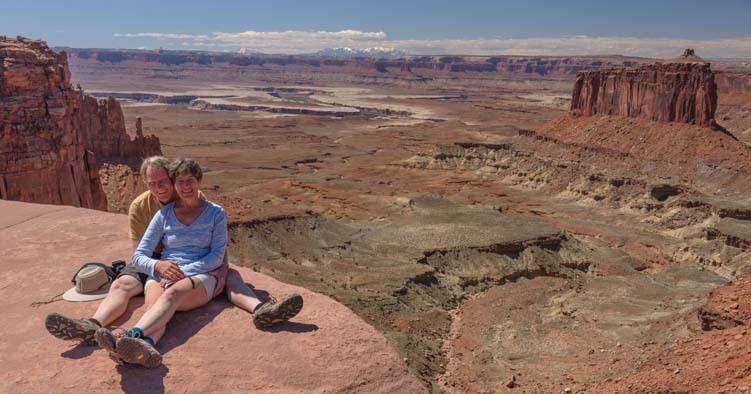 We dashed into Canyonlands National Park for a day to check out all the overlooks and scenery visible from the main road. We wandered around the overlook at Shafer Canyon for a long time soaking in the view. A fabulous and enticing dirt road snaked across the canyon. 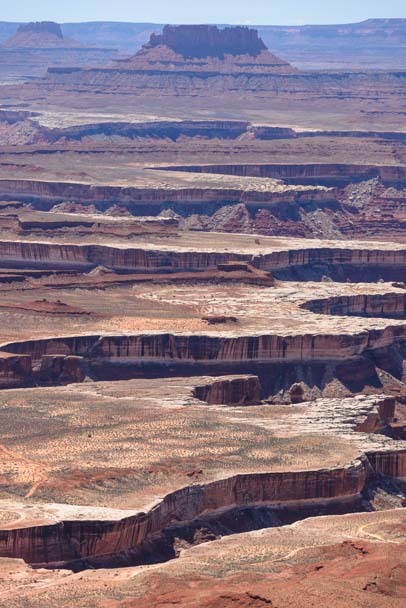 This is part of the 71 mile long White Rim road that we had seen a few days earlier at Dead Horse Point State Park. An intrepid jeep driver was descending a wall of the canyon near us. What a cool drive that must be. Someday!! 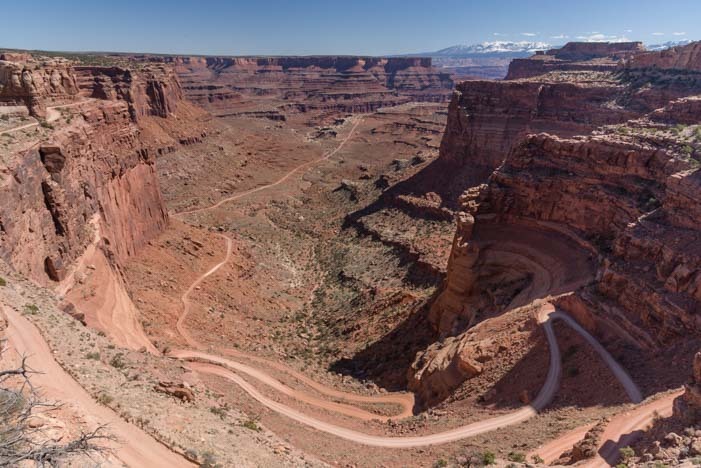 The White Rim Road looks like quite a ride!! 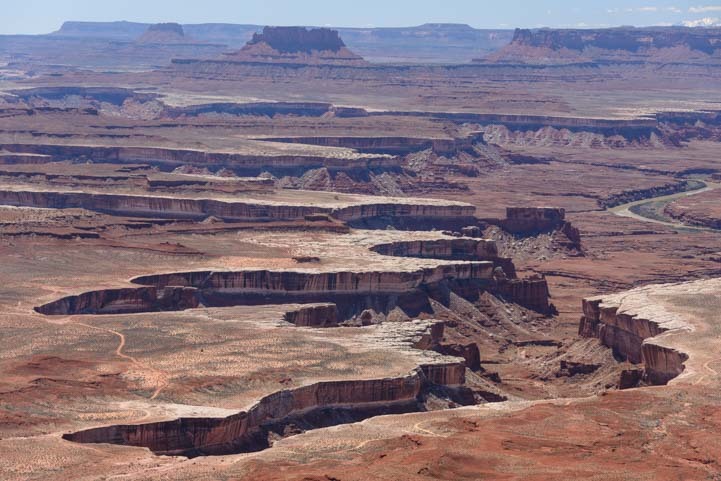 Each canyon and overlook in the Island in the Sky district of Canyonlands is beautiful. It had rained a few days earlier, and some of the depressions in the wide flat rocks were filled with water. Puddles had formed in the red rock depressions. Funny thing is that we kept getting in each other’s photos! Is that a painting behind us?? 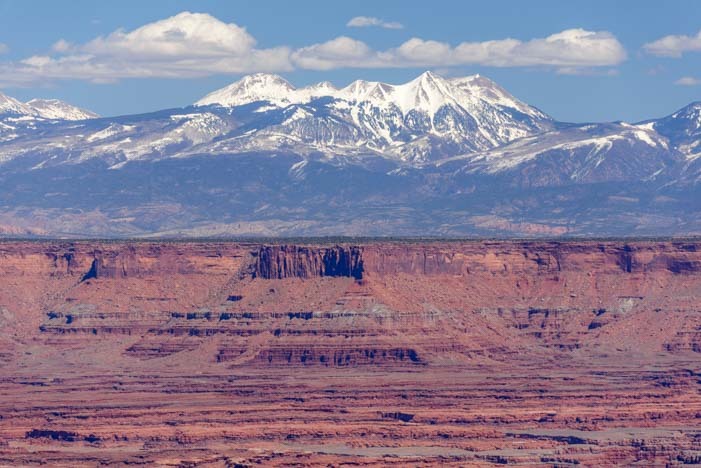 The red rocks of Canyonlands National Park and the white capped mountains in the distance made a beautiful contrast. Red rocks and snowy mountain peaks – Gorgeous! 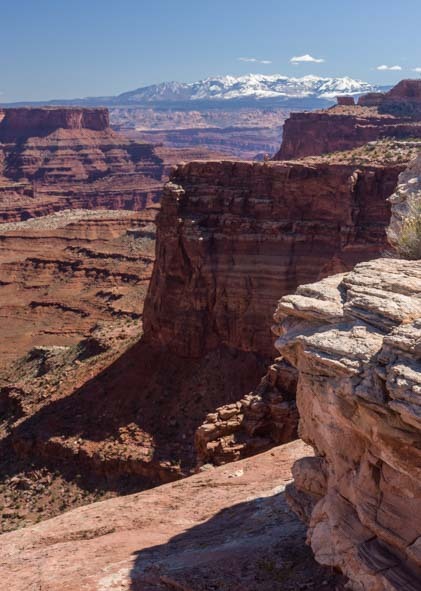 Without a doubt, Grand View Point has the most dramatic landscapes in Canyonlands National Park’s Island in the Sky district. Here the flat earth seemed to have been carved by an enormous stick that had been dragged across the land to gouge out a pattern. Nature’s handiwork – what a fabulous design! The tiny White Rim Road was still visible, but it was impossible to fathom the size and scale of this immense landscape before us. I just LOVE this pattern! In the evening, our attention turned to the heavens. 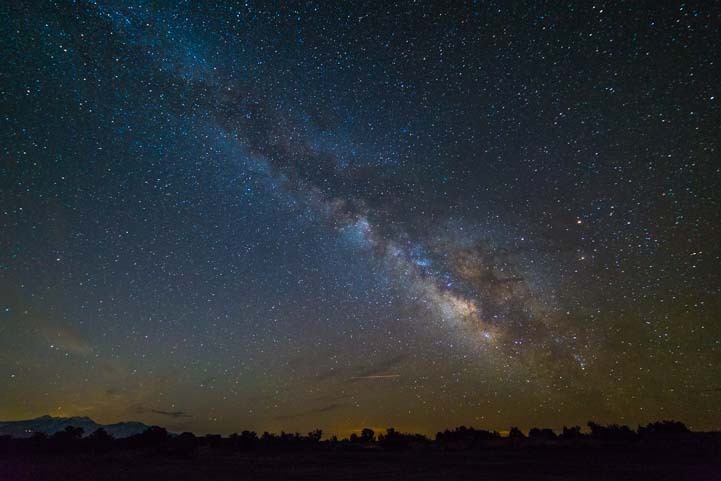 The southern part of Utah has some of the darkest skies in America, and the stars were thick above us. There were layers upon layers of stars in the sky. As the night wore on, the celestial dance in the stratosphere became ever more intense, and the clouds of stars that make up the Milky Way practically jumped out at us. The Milky Way came to life in the heavens. 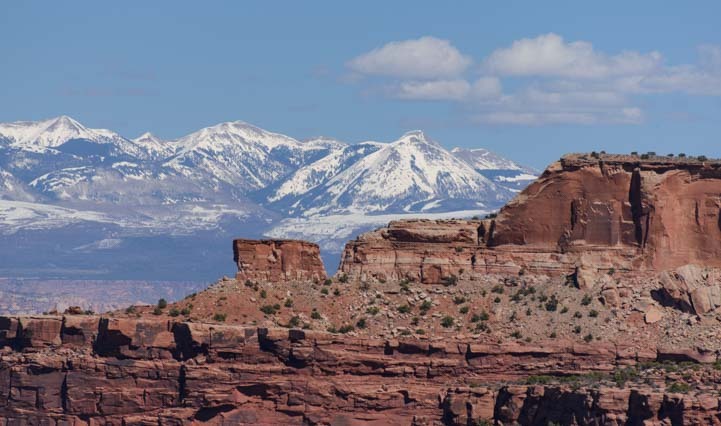 Moab, Utah, is a wonderful destination for an RV roadtrip, and along with Arches National Park, Dead Horse State Park, the Canyonlands Needles District and Newspaper Rock, the Island in the Sky district of Canyonlands National Park has to be included in the Moab “to do” list. 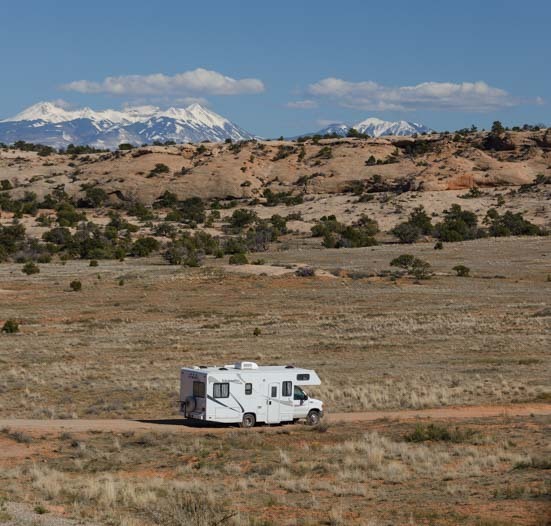 The whole area around Moab is wonderful for an RV adventure. And it doesn’t matter what kind of RV you have: big, small, new, old, solar powered or not, any kind of RV that can be driven or towed will fill the bill, and while we were there we saw some pretty unusual get-ups!! If you can drive it or tow it, any kind of RV will do!! 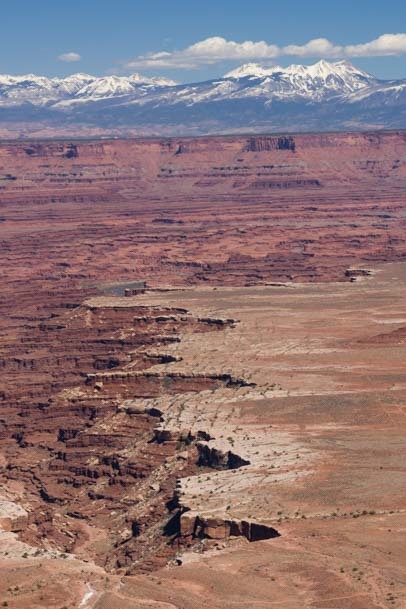 For more info about Canyonlands National Park, check out the links below. 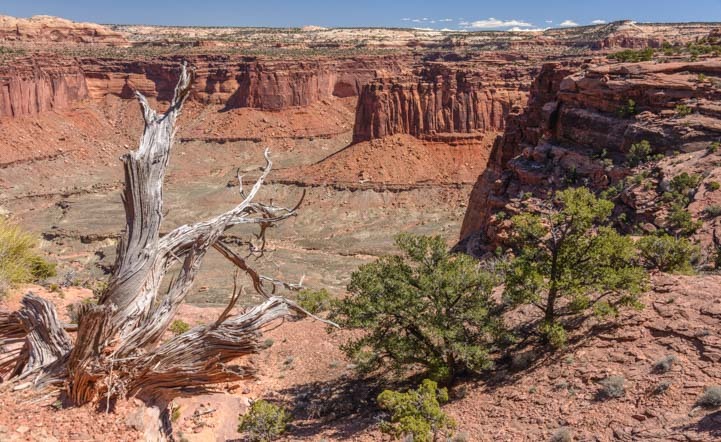 Where is Canyonlands National Park? 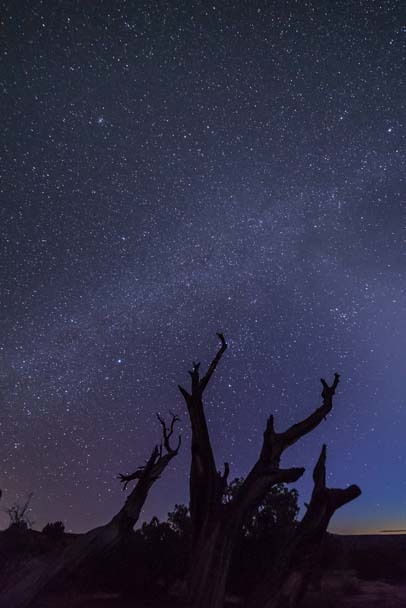 This entry was posted in Utah and tagged Milky Way, National Parks US, New, Night Hikes, Travel, USA, Utah, Utah Southeast, Utah Southern, WP Travel by Roads Less Traveled. Bookmark the permalink. 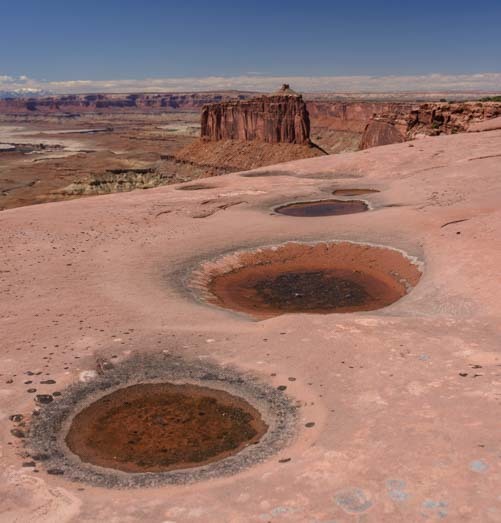 We’ve not yet been to the Island in the Sky District of Canyonlands — after seeing your photos, we’re putting it on the list! Grand View Point looks amazing. You guys have been capturing some gorgeous nighttime shots, as well. Impressive! We have Mark to thank for those two starry sky shots — so beautiful. 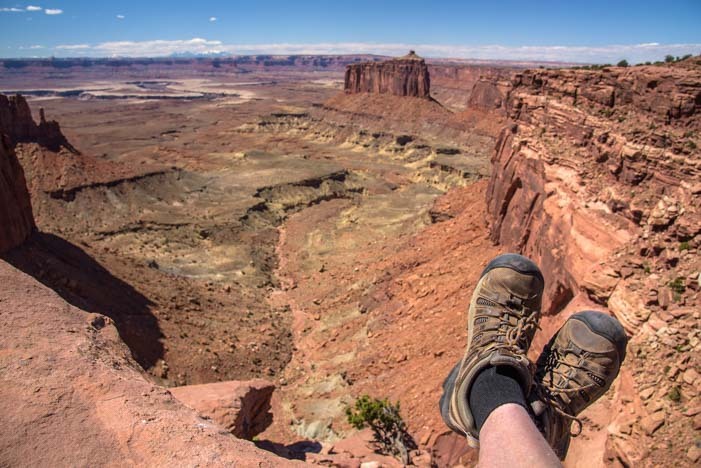 You’ll love Canyonlands. We barely scratched the surface. There’s so much more to see if you take a few days to get down into it all…!! Wow, this looks so awesome! Very good pictures! A Jeep is the perfect car to drive while exploring this area! They’re dependable, spacey, and drive smoothly! It looks like you both really enjoyed yourselves here! Nicely captured! Thanks for sharing! Curious about Solar power for your RV or boat? A portable solar power kit (left) or a full-timer solar kit (right) may do the trick for you! Learn more at our webpage: Solar power for RVs and Boats. To eliminate condensation on our windows, we use an Absorber XL Towel (left) first, to mop up the moisture, followed by a Microfiber Towel (right) to make sure there's no streaks. More here: Winter RVing Survival Tips!